Alena Telford: The True Nature Of Tarot by Diane Wing, M.A. 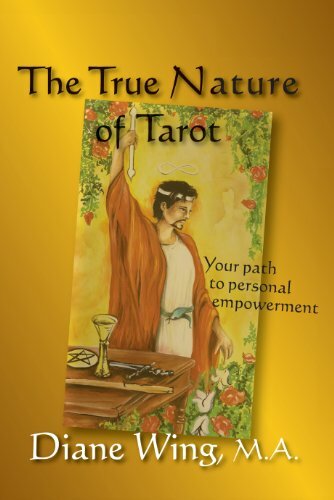 The True Nature Of Tarot by Diane Wing, M.A. The True Nature of Tarot: Your path to personal empowerment is tool to help your spiritual growth. Author, Diane Wing, has created a guide to those who have questions about Tarot. She provides insight into all aspects of Tarot showing the reader that it isn't warrant of the negative press that it has received throughout its history. Diane has been reading the Tarot for over twenty-five years as well as being a Reiki master, teacher and life coach with a Masters degree in psychology and many years in intuitive studies. Diane has spent many years fine tuning the art of Tarot and providing all she knows in this comprehensive 101 manual for the newcomer and a more advance reader for the experienced, it suits all who read it. This book will allow you to experience your own intuitive abilities by helping you to grow or you can just use this as a casual reader answering any questions you may have about the subject. There is also a section in which she discusses the purported "evil" aspects of Tarot, bringing many interesting thoughts to the fore. I loved how this book will take you through the steps of getting your cards read and the danger signs to look out for, as well as, there are tips for the card reader within the pages. I thought it was really well written and didn't leave me wondering what the author was talking about. I was equally thrilled to read about the individual tarot cards themselves. I have never seen anyone describe the cards such as Diane Wing has, they are more true to human nature than the stiff descriptions of other cards I have read! I enjoyed reading all the things that could impact a reading, I don't read tarot myself, but my youngest sister does and I was amazed to see that she did things mentioned in this book naturally. I always thought she had a remarkable gift and after reading The True Nature Of Tarot, I can see she truly does!